With that said, I'd like to postprocess this into something that looks more attractive in lieu of going to the same location and lucking out for the same kind of weather and nice cloud/sky mix that I had in the above shot. What kinds of adjustments could I make so that the sky isn't so washed out? I'm not looking for anything that looks unrealistic by going overboard on contrast or saturation, just stretching out a bit more detail so it isn't so washed out. Based on my above description, you can tell I'm somewhat of a beginner, especially when it comes to postprocessing techniques. Another note: with landscape photos, I know a common answer is "Find a more interesting landscape." I would like to make a print of this photo as a gift for a friend; this particular spot and view were chosen because they were of significance to them, so I would like to preserve this overall image if possible. You can lower the highlights and push up the shadows. This will help a bit with the overexposure on the sky and underexposure in the foreground. 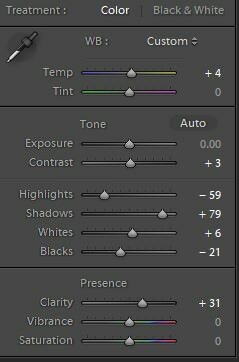 Here are the settings I have used to achieve this. Although it would probably be better to go and redo the shot if you want to print it. You can get quite a bit out of this by saving some of the highlights, making the image overall warmer and more saturated, and finally doing a bit of selective dodging/burning. I'd use a brush tool on the sky and the tree in the center above the sky. Not the answer you're looking for? Browse other questions tagged post-processing landscape or ask your own question. How to achieve even brightness in landscape photography? How to boost tones preserving highlights? How can I automatically correct aerial perspective in landscape photographs? 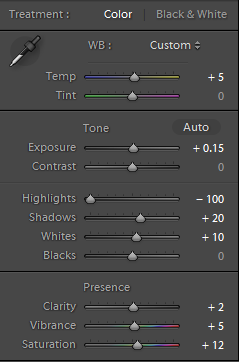 How can I maintain brightness in a landscape without overexposing the sky? Is landscape photography mostly associated with visual beauty?